on 13th - 18th October 2013. “The Rainbow Connection” is now a warm and happy memory to be treasured, along with thoughts of new friends from around the globe, who have enlarged our ‘Shute connection’ circle. 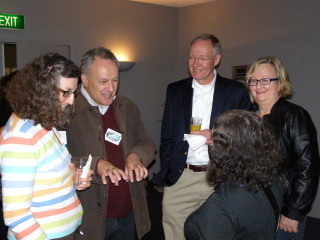 Even before Laura’s highly successful Seattle 2011, we were approached by Tommy and Polly Thomas, who said Tasmania (our new home) had been proposed as a possible venue for AUS 2013, based on “The Rainbow and the Rose”. Knowing Hobart from holiday visits, they asked if Chris and I would consider joining them as part of an organising team, going on to suggest two possible conference venues they knew and thought appropriate. 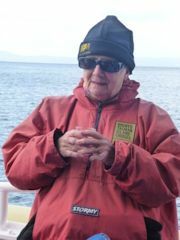 Our Tasmanian Shute connections: First there was the local librarian’s suggestion we read “King of the Wilderness” by Christobel Mattingley, then Chris found his Adult Education drawing class teacher was Janet Fenton. Then we both took Marine Drawing, also taught by Janet! Within weeks we discovered the yacht “Saona” was only a 40-minute drive away from our home. We contacted her owner, Ben Marris, and were soon sitting aboard discussing Nevil Shute over a cup of tea with Ben. 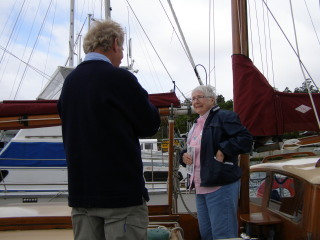 Then we met Mary King at a Wooden Boat Guild meeting. 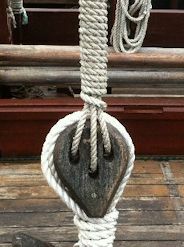 She confirmed what Janet had told us; they still had the ship’s lantern Nevil Shute had sent them, following his 1953 visits to their family’s remote settlement in the southwest. All these intriguing connections did seem to be pointing us towards a Tasmanian gathering ! AUS 2001 had been a fantastic week but, unable to make it to any subsequent conferences, we’d lost touch, except for snippets in the newsletter or on the website. After much soul searching between June and October of 2011, we decided to give it a go, as part of a more experienced team, having a full two years to coordinate it. Despite a warning from John Anderson about the amount of work involved, we e-mailed the N.S.F. 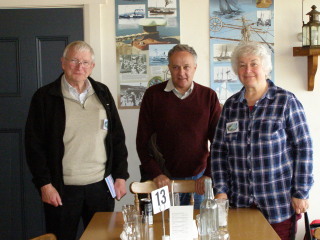 Board members in mid October 2011, to say we were willing to accept the challenge. By this time Maurice Jones had withdrawn from the ‘team’; he and his partner were returning to live in New South Wales. But we still had Polly and Tommy to rely on, with their more recent conference experience. 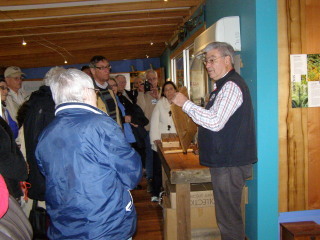 Chris began a search for display items, encouraged by Tommy’s offer to bring two engineering gems, Nevil Shute’s micrometer and a model of the Swallow! Good start! 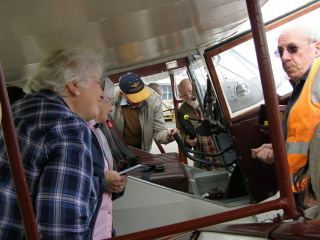 Chris also searched for a Seal, a Congreve Clock, a Proctor model and an Auster model, but kept running into dead ends. 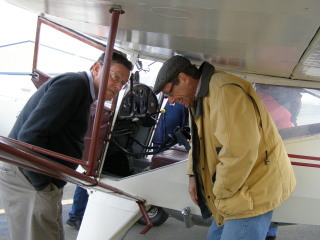 He did manage to track down a full-sized Auster, in a hanger at the Hobart Aero Club near the Airport! Great! We went into high gear, with serious coordination and planning taking precedence over other activities. Little scraps of paper, ideas tossed haphazardly onto our desks, were sorted into orderly piles, a time frame set down, unending lists plus a master list made up, venues investigated, then early in 2012 we began sending monthly reports to Joost for the newsletter. About that time we had an unexpected boost. 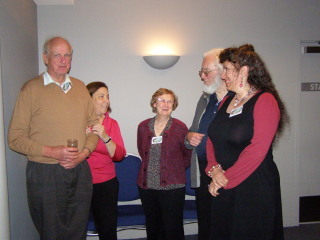 Laura Schneider and John Anderson, experienced conference organisers, offered their guidance and support. They would answer any questions we had. This meant a lot to us; they were both very busy people and John also involved in putting final touches on “Parallel Motion” for his publisher. Tommy and Polly, globe-trotting, now offered to assist with registration and greeting delegates. That would be helpful, but it appeared the rest was up to us. A pre-conference survey indicated there was interest from many corners of the globe, with nearly forty indicating they hoped to sign up. This was most encouraging but, later on, one by one, many expressed doubts, dropping out, citing health issues, schedule conflicts or financial restraints. We continued planning, fingers crossed the numbers would work out. By March 2012 we’d checked out a couple of possible venues and decided that The Old Woolstore was the obvious choice. The history and atmosphere of the place was impressive, the meeting rooms looked excellent and their friendly, efficient staff anxious to accommodate us, as well as being familiar with the name Nevil Shute! At another venue that was not the case. They agreed to give our delegates a special bed and breakfast rate, enabling them to save a few dollars. We soldiered on, designing a logo, posters, a name tag and, on a timely suggestion, bookmarks. Chris started making pens (gifts for our delegates), using Tasmania’s native timbers. We checked out possible venues for excursions that would please all tastes, trying out numerous locations for meals, morning and afternoon teas. We were saved the worry of finding willing presenters. They came to us, with exciting proposals for presentations. Gradually, the week’s activities started to fall into place. By late October, less than a year out, we organised with a friend to handle media details for us, getting the word out both locally and further afield. He assured us it was all in hand, but later failed to follow through, particularly with newspapers here and on the mainland; this undoubtedly hurt our numbers. We were pleased to find Shute-connected locals were only too happy to be part of our conference week. 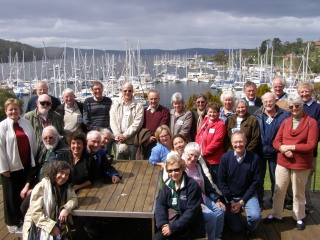 New presenters anxious to complement experienced ones from past gatherings would add a Tasmanian touch to the schedule. 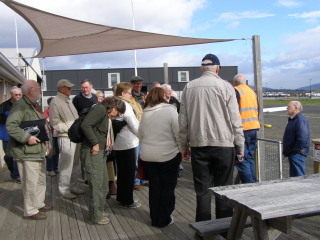 Owners of venues we settled on for excursion days were enthusiastic, helpful and easy to work with. Weeks flew by. E-mails, both in and out, reached monumental proportions. We were well underway with the delegate books and found a business willing to make good quality satchels with our chosen design, at a reasonable cost. John then made a huge contribution by designing the conference webpage for us, adding information as it became available; patiently making change after change as plans developed...or failed to! He also saved us enormous hassle by organising Regonline, going live in May 2013. This was a tremendous help, despite a few hiccups as people found their way around its use. Both Laura and John were amazing, answering the hundreds of questions and concerns we bombarded them with, drawing on their previous conference organising experience, calmly allaying our fears. One major concern was whether or not we’d end up with sufficient numbers to balance the budget we’d been figuring. We tried our best to keep the delegate fee below (Australian) $600.00, knowing travel to Tasmania is as logistically/financially challenging as Alice Springs had been. Restricted by the shocking increase in the cost of food in this island state (doubling in the past ten years), we still wanted to provide the best meals possible, to make the week good value for everyone. Accommodation bookings seemed to present problems, despite our repeated reminders in the newsletter and on the website during the six month lead-up. We stressed, in capital letters: read the ‘important information’ section of the web page, then when booking be sure to identify yourself as part of the Nevil Shute group, then quote our booking number, 8434. This would guarantee them a room, entitling them to the special bed and breakfast rate we’d organised. Somehow, for a small number of delegates, the message failed to get through so, disappointingly, they booked at other hotels, thinking our rooms were fully booked. If they’d followed instructions, or at least let us know they were having problems, we could so easily have helped ! We did receive one or two comments about the cost of rooms, but during the southern winter most hotels drop their rates dramatically, in order to fill rooms during the colder months, between June and August, with rates returning to normal in September. Unfortunately this may have been misleading. John had estimated our break-even number at 28. He guided us as we prepared to submit the budget to the Board, fingers crossed as registrations were low, but it all seemed to add up. The biggest unknown was final numbers which, in the end, were just barely enough. Last-minute challenges tested our resolve, but each was eventually overcome. We were very disappointed when Polly and Tommy told us they were unable to come. 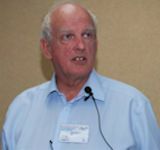 A major concern was total silence from one of our top presenters, David Henshall on the Isle of Wight, for several weeks prior to the conference. John had tried in vain to contact him, hearing at the last minute that he’d had an unfortunate accident aboard a boat, while filming a story, suffering a severe back injury, so was unable to fly! John received David’s Power Point presentation only hours before his own departure and did a superb job of talking us through it on the day. Sadly, due to a family death and to illness, two of our delegates were forced to cancel at the last minute, leaving the numbers precariously close. The weekend prior, four dear (non Shute!) friends pitched in and helped us assemble delegate books. Coming over on the Saturday evening, they found 30 piles of the 30 pages carefully spread out on our spa cover. Assembling them in record time, we retired to the living room to slide them into plastic sleeves in the books. Once that was done, several pizzas were demolished, washed down with a few bottles of red. Anything but an onerous job! The big week arrived. 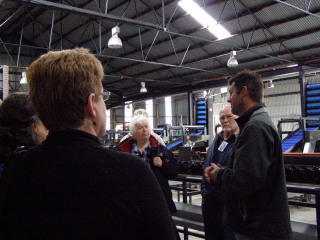 Saturday, 12th October we drove into Hobart, unloaded everything and checked in at The Old Woolstore. Heather had arrived earlier, so we delighted in renewing our 12-year friendship, while waiting for the rooms to be ready. 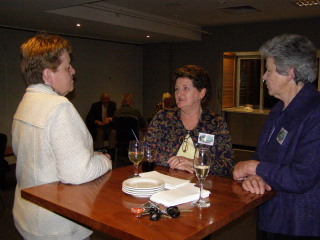 A short while later Alison arrived, soon followed by Babette, one new friend and one renewed. Then John sauntered in, to a big hug, in gratitude. What a pleasure to formally meet our dedicated mentor at last. We already felt we knew him after all those months of electronic communication! When Laura arrived there were more big hugs, as we renewed our 12-year friendship with her, finally able to thank her face to face for the past eighteen months’ invaluable support and guidance. By evening the group had grown. 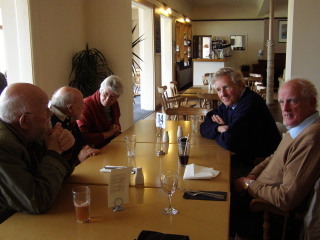 It was an animated, talkative group that gathered for dinner in the in-house Stockman’s Restaurant. Breakfast Sunday (included in our room tariff) was as healthy or indulgent as we wished; a smorgasbord of delectable choices ranging from muesli, fresh fruit and toast, to croissants, stir fried baby spinach leaves with pine nuts and red capsicum, braised mushrooms, eggs of every description, plus the traditional bacon, sausages, hash browns, tomatoes and baked beans, all washed down with coffee, tea or juices. We were surrounded by willing helpers as we set up displays, registration and book sales tables. A rustic box of freshly-picked organic Tasmanian apples had been delivered by Willie Smith’s Organic Cider Production, generously donated for all to enjoy throughout the week. More offers of help at registration time, to meet and greet or hand out delegate packs. Our dear friends Cherelle and Robin arrived at mid-day, supplying us with endless cups of coffee, glasses of wine, cheese-and-cracker snacks during the afternoon. 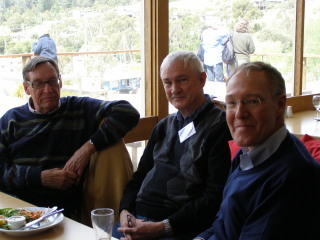 It was great to see old friends from Frankston again, plus new faces we could now match up with names on registration forms. Good old Shute camaraderie was in action. John took the opportunity to check out facilities in the theatrette, for sound recordings on presentation days, finding the staff helpful and, with one or two modifications, the system apparently workable. Sunday evening we gathered in the Merino Room for the cocktail reception, two delightful hours of drinks and canapés while catching up with Shute friends, old and new. Monday at 9am we gathered in the theatrette, in anticipation of the more structured part of the week. 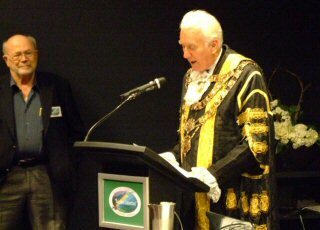 After a short welcome from the organisers, the Lord Mayor of Hobart arrived, in full regalia, to give a warm and sincere welcome to his city. Heather was next, with her special welcome, wise words on behalf of her famous father and a brief outline of the week ahead. Laura followed, reading a delightful story from Barbara Niven, “Breakfast at Norways’”, an excerpt from her memoirs which proved a great hit with the group. Laura went on to encourage everyone to take this opportunity to consider formation of additional Shute study groups, around Australia, or anywhere there were sufficient Shute followers to make it feasible. We broke for morning tea, out in the foyer. The obligatory Devonshire tea (scones, jam and cream now traditional at Aussie gatherings), plus a savoury alternative, was set up for us along with tea, coffee, water and juice. Our initial presentation, Shoshana Knapp’s “Women of Power and Glory; Some Surprising Female Characters in the Fiction of Nevil Shute”, was a dynamic in-depth look at some of Shute’s minor female protagonists. Enhanced by her impeccable research and insight, Shoshana’s talk was warmly received by all present. A spirited question and answer session followed. Our light lunch, a smorgasbord in the Stockman’s Restaurant, featured a variety of breads, cold meats, salads and fresh fruit, plus a tempting pumpkin soup. 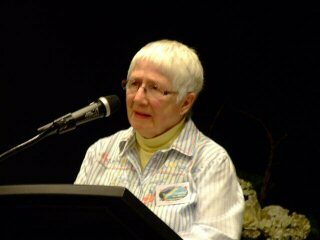 After lunch we were treated to a fascinating presentation, “Rainbow Country; Southwest Tasmania as Inspiration for Shute's "Rainbow and the Rose" by Mary King and Janet Fenton, daughters of Deny King, legendary tin miner in the remote southwest wilderness area of the state. Their presentation, prepared especially for our gathering, with assistance from Janet’s husband Geoff, illustrated exactly what Shute would have experienced when visiting their home in 1953, making the pages of his novel come to life. The lively question and answer session was testament to the interest of their rapt audience. They had set up a fascinating display in the foyer: the lamp given them by Nevil Shute following his 1953 visits to their home, the guest book he signed, relevant books and photographs, all of which vividly depicted their family life in the mid 20th Century. This display more than made up for the lack of models we’d tried to obtain, falling back on posters, books and photographs, plus a few items from our yacht, “An Old Captivity”. 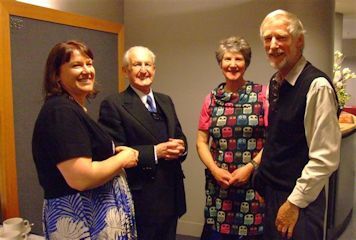 A brief but relevant address by Christobel Mattingley was a late addition to the schedule, along with a short chat by her husband David, who had met Nevil Shute during his World War II service. 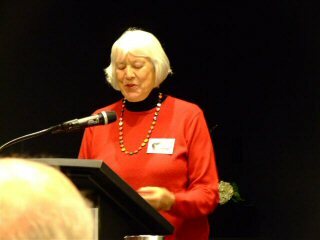 Author of Deny King’s biography, “King of the Wilderness”, Christobel related her own involvement in “The Rainbow Connection”, a fitting adjunct to the afternoon’s presentation, before we adjourned for afternoon tea. We had adjusted the schedule to include David Henshall’s “Beyond the Black Rock” at this time, to accommodate the time difference between Tasmania and The Isle of Wight. David, unable to be with us, had sent his power point presentation to John, in the hope we’d be able to establish a Skype link with him. Unfortunately, despite Alison’s best efforts it was not possible. John did his best to describe David’s photos and their relevance to Nevil Shute’s time in The Solent area, which was most interesting, but we could only surmise the significance of each shot. Well done, John! Monday evening was free, with delegates walking to several nearby restaurants along the waterfront for dinner. Tuesday, our bus excursion day, dawned cool and overcast, but as everyone gathered in the foyer to wait for the bus, there was an air of excitement and anticipation. 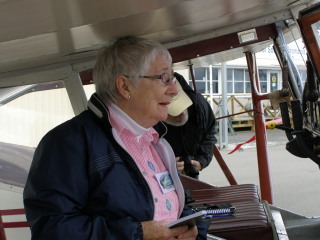 As we boarded the bus, our driver, Yvette, impressed us with her bright, cheerful friendliness. A friend, Frank, joined us for the day. The schedule had been revised, so we headed east across the Tasman Bridge over the River Derwent, with Chris relating a tale of disaster. In 1973, the ship “Lake Illawarra” collided with a bridge pylon, causing one complete span to collapse into the river! Several people died, some cars went over the edge and the ship sank, never to be retrieved. 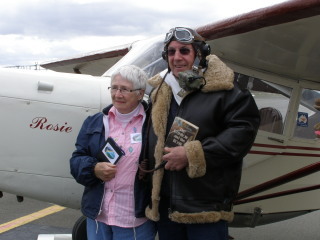 Fifteen minutes later we arrived at Hobart Aero Club and met Rob Gard, owner of “Rosie”, the Auster. Rob had hoped to do a flyover for us but, grounded by a health issue, he proceeded to show us his plane on the tarmac, answering many penetrating questions. 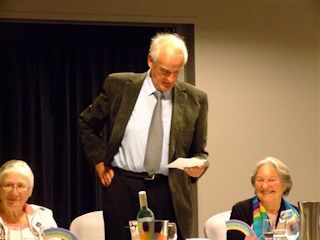 We moved into the club rooms, where his spirited talk included reading a passage out of “The Rainbow and the Rose”. When he asked Heather to sign his copy she agreed, IF he promised to finish reading it! He then donned appropriate flying gear, posing for photographs, much to the delight of all assembled! It was time to move on, so we reboarded the bus and drove back to Hobart, having to skip the Tasman Memorial in order to stay on schedule, driving south through the waterside suburbs of Sandy Bay and Taroona, with their picturesque historic cottages from Hobart’s early days, past the historic Shot Tower, and up over the hills with frequent panoramic views of the river below. One sharp-eyed passenger spotted a property called ‘Landfall’. Proceeding down through Kingston, Margate and Snug to the beautiful waterside village of Kettering, we arrived at the yacht basin and small marina in time for morning tea at the Mermaid Cafe and a chance to go aboard Ben Marris’ beautifully restored yacht “Saona”. 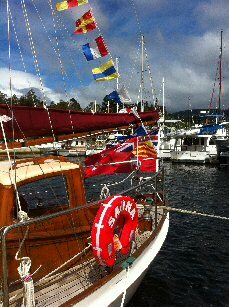 She was Nevil Shute’s transport to Deny King’s remote settlement on the southwest wilderness coast in 1953, on more than one occasion. 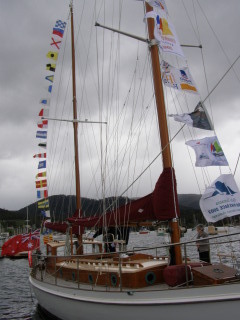 Ben had ‘dressed ship’ appropriately, with the bunting spelling out ‘Nevil Shute, Port Davey’...a special touch. 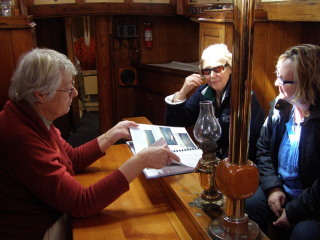 Ben was on deck to answer questions, with wife Jane below-decks exhibiting a photo album of their recent passage to Port Davey. 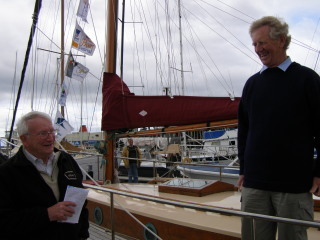 How interesting to sit on the berth Shute had used on the voyages, thinking back to what he must have experienced during his adventure of 60 years ago! Back on the bus, we made the short drive up the hill to our lunch spot, the Oyster Cove Inn, for an authentic Aussie pub lunch. We had a choice between: salt and pepper squid, chicken parmigiana, fish and chips or roast of the day, with salad or veg, washed down by wine, beer or a soft drink. Ben and Jane were our guests for the meal. We returned to the bus for a drive over the hills WITHOUT the promised expansive views, thanks to overcast skies, mist and drizzle obscuring the landscape below, but at least being treated to a beautiful rainbow! Over the top and down into the village of Cygnet (our home for the first five years in Tassie), we hoped to see a black swan or two, but they had obviously retreated from the weather. Winding our way through apple and cherry orchards, past grazing sheep, we continued over another hill and down into the Huon Valley, home of Dr. Turnbull in the novel. 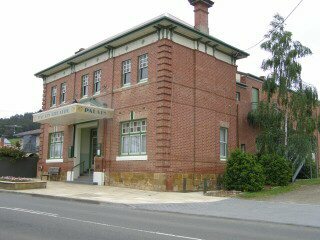 Following the Huon River south, we soon arrived at the village of Franklin, home of The Wooden Boat Centre and the historic Palais Theatre, also mentioned in the book. Had we driven south another kilometre we would have seen the Palais, answering the question of a voice in the back of the bus. 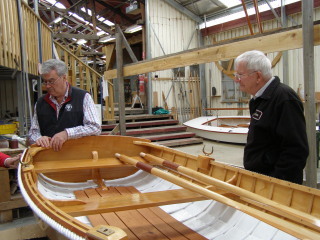 At the Wooden Boat Centre we disembarked for a tour with owner Andy Gamlin and assistant Pete. 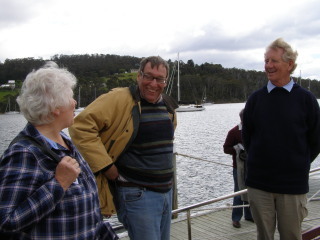 Here we were enlightened on the finer points of wooden boat construction and restoration, immersed in the scent of the world’s premier boat building timber, Huon pine, before indulging in yet another afternoon tea of delicious home-made scones, jam and cream. Back on the bus after rounding up stragglers, some of whom were photographing the Russian Viking ship replica on the wharf. 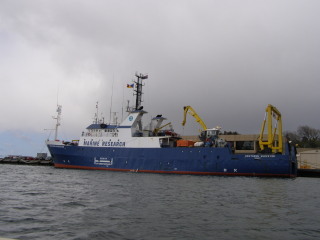 “Rusich” had been built near Moscow and sailed down rivers to the sea, for a two-year voyage to Hobart, expressly to take part in the Wooden Boat Festival in February 2013. Fears were that she wouldn’t make it on time, as she encountered severe weather coming down Australia’s east coast but, miraculously, she had sailed up the Derwent triumphantly, just in time to join in the opening day’s parade of sail, much to the delight of thousands of onlookers! We turned north to Huonville, towards our next destination, Willie Smith’s Cider production plant, for a tour and tasting with 4th generation owner Andrew. A young man so focussed and innovative that he can’t help but be successful, he impressed everyone with his experimental methods, both in the orchard (where his feathered workers clucked their way around under the trees, eliminating the need for fertiliser or insect sprays) and in the processing plant. The cider was delicious. 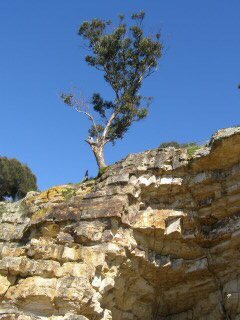 Battling against the clock once again, we had to bypass a proposed stop on the summit of Mount Nelson for a panoramic view of Hobart, the river and surrounds, plus a look at the historic semaphore signal station used to transmit messages in colonial days. Our driver, Yvette, willingly worked (unpaid) overtime to make sure we made the most of the day, so Laura very thoughtfully passed the hat for her, as we returned to The Woolstore, to go our separate ways for dinner. After another scrumptious breakfast, we reconvened for Alison Jenner’s “Thinking it Through; Ethical Dilemmas in Nevil Shute’s Novels”, a thought-provoking session during which we broke up into groups, each assigned a specific moral issue to debate. The conclusion was presented to the entire gathering, who subsequently voted on their choice for a mass discussion. A fun and fascinating exercise, it resulted in some heated differences of opinion, before we broke for morning tea. 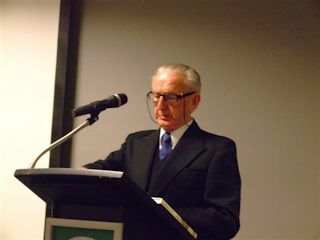 John Anderson then fascinated us with his presentation “Nevil Shute and the Technology of His Times”, a most interesting insight into the evolution of technology during Shute’s lifetime, from the birth of aviation to the atomic age and the dawn of the space age. Spanning two world wars and the early stages of a ‘cold war’, this period helped spawn and perfect ingenious inventions as diverse as the grand panjandrum and the first nuclear bomb. Needless to say, the question and answer session was a spirited one. Next were the first of Laura’s “Reading Nevil Shute” speakers, each reading a passage from the book of their choice, relating the significance it held for them personally. Heather’s was from “No Highway”, followed by Robert Wester. Lunch followed; another great selection of cold cuts, breads, salads and fruit, plus a delectable sweet potato and brie soup, to sustain us for the afternoon. As we returned to the theatrette, Lawrence Johnston had arrived and was preparing to show his highly acclaimed film “Fallout”, a documentary feature celebrating the life and work of Nevil Shute, his writing of “On the Beach” and the subsequent making of Stanley Kramer’s 1959 film in Melbourne. Lawrence had incorporated archival film not previously seen and, with Heather’s poignant commentary throughout the film, it held us spellbound. Its overpowering message could only confirm the ongoing resonance of Nevil Shute’s incredible vision. After a thought-provoking question and answer period, we adjourned to the foyer for afternoon tea, mingling with our guests and looking at the displays, after which it was time to prepare for the banquet. The Woolstore staff busied themselves transforming the Merino Room into our banquet hall, as black tablecloths and white chair covers set off table decorations of rainbows and roses with pots of gold (chocolate coins in gold foil), in accordance with the week’s theme. The evening was an opportunity for everyone to don their finery for our nice night out. Curt Gomer secured the prize for ‘best dressed’, looking magnificent in his kilt! Our special guests arrived, mingling with delegates over pre-dinner drinks, before everyone found their seats for the three-course dinner. We had a choice of two selections for each course. As entrees were served, Chris introduced our special guests. 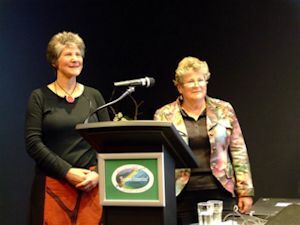 Besides guest speaker Bill Vincent and his daughter Kelsey Hartland, we had Mary King and daughter Kylie, Janet and Geoff Fenton, Ben and Jane Marris, (apologies from Rob Gard, Lawrence Johnston and his producer Peter Kaufmann), and last minute guests David and Jenny Rayner. 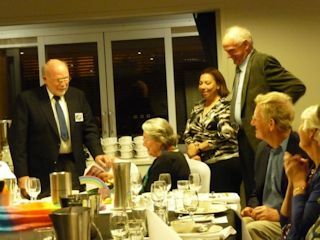 Dessert and coffee were served while our guest speaker, Bill Vincent, delighted us with tales of his mid-air exploits during the time of Shute’s visits to the airfield near Smithton in northern Tasmania. The distinct parallel with incidents in “The Rainbow and the Rose”, confirmed the connection between Bill as a young man and a blend of Shute’s characters Billy Monkhouse, Johnnie Pascoe and Ronnie Clark. It was a most enjoyable evening. The highlight for Chris and me was being presented with an extremely special gift, in appreciation for organising the week. We were totally overwhelmed, almost speechless, when un-wrapping the beautiful green and gold package, to find a first edition of “The Rainbow and the Rose”! Even more thrilling, it was signed! Not only that, but Nevil Shute had signed it in 1958, the year we were married. It is a gift we will always treasure. The book was accompanied by a striking black and gold thank you card, jam-packed with good wishes and accolades from almost all our delegates, to bring back warm and happy memories of the week. 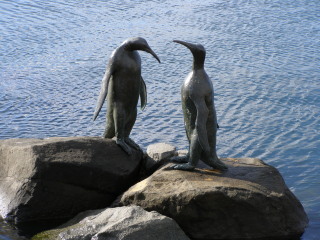 Thursday morning we gathered in the foyer, picked up our boxed lunches and walked across to the waterfront, where we had a quick look at the Mawson memorial; life-sized bronze statues of the arctic explorer, his camera and one of the sled dogs, against a background of bronze seals and penguins on the rocks, then made the short walk to the cruise boat office. 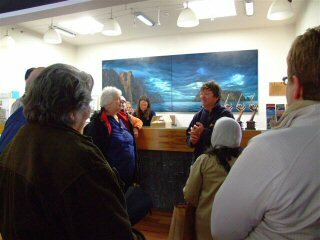 Owner Rob Pennicott gave us a pre-cruise briefing, during which he promised to rearrange a few hairdos! He did! 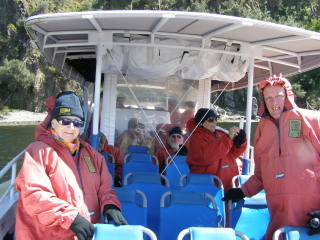 We went down to the boat, a purpose-built high-speed ‘4WD of the sea’, designed to carry over 40 passengers, in any weather, and spent the next few minutes suiting up in the long, hooded, poncho-like, supposedly waterproof garments, plus warm wool beanies and gloves, in preparation for the cruise. 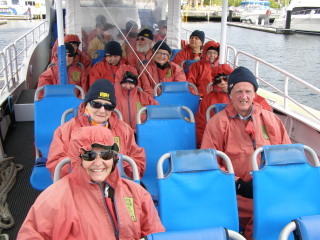 Most of us were so rugged up we were barely recognisable. 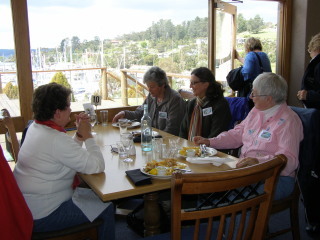 Seated at last, and after an airline-type safety briefing, we cruised out into the River Derwent and down the western shore past the casino and waterside homes, admiring spectacular 180-million-year-old Tasmanian dolerite cliffs and caves, keeping an eye out for the wildlife of our southern shores, all in relative comfort (some might question that last phrase!). 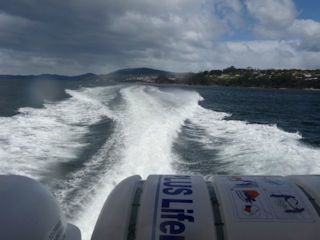 Thanks to sharp-eyed owner/driver Rob, we spotted a majestic sea eagle. Weather conditions were not ideal. 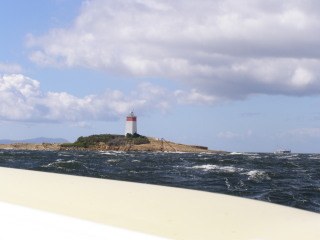 Overcast skies, occasional showers and a high temperature of less than 20 degrees Centigrade with winds gusting to 40 knots made the seas a bit lumpy, especially when crossing open water to the Iron Pot light house, but Rob’s expertise in these waters minimised discomfort. His commentary was excellent and the history of the light house enlightening, as cameras clicked repeatedly. We made our way back across the estuary to the shelter of Bruny Island’s eastern side, unfortunately having to forego our picnic on the beach, thanks to Mother Nature’s strong nor’westers. Our prevailing winds, the roaring forties, are well named! 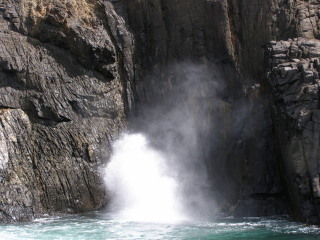 Following the shoreline, we continued down past endless ancient dolerite cliffs, mysterious caves and the occasional blowhole. Rob has perfected the art of nosing the boat in precariously close to the towering rocky shore, anticipating the surging swells, deftly putting her into reverse gear a split second before it seemed she’d be smashed onto the rocks. 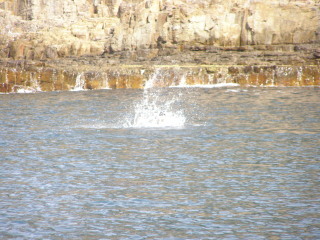 There were thrills for all and plenty of photographic opportunities, as we dodged unexpected spray from errant blowholes. I commended Heather for her adventurous spirit, to which she replied with a smile, “I inherited it!” How fortunate we are to have her to inspire us. Unfortunately, whales, dolphins and penguins must have retreated from the weather, but we did see one lone seal catching his lunch. He repeatedly flipped the fish into the air, slapping it onto the surface, almost as though posing for the cameras. We found a little cove with relatively calm water for our lunch spot. 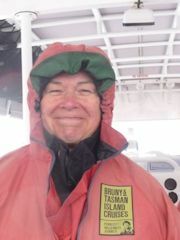 To minimise discomfort from the swells, Rob kept the boat circling while he and his crew, Brent, helped us mix up and distribute hot tea, coffee and chocolate. The cruises don’t normally include hot water for drinks, but Rob said, “We’ll work it out!” and they did, anxious to ensure our day was a success. It certainly was ! Making the drinks was no mean feat. They’d set up a huge pot full of water over a large gas ring on the heaving deck, using a small pan to carry boiling hot water back and forth to the foam cups and drink mixes. The cups were then passed hand to hand to all who needed sustenance, despite the warm clothing. The hot drinks were an enormous hit. Our boxed ploughman’s lunches were tasty, washed down by the wine we’d bought for our proposed beach picnic. A Tassie ‘white’ called“On the Beach”! Even if we didn’t end up lunching ashore, how could we even consider serving anything less ? 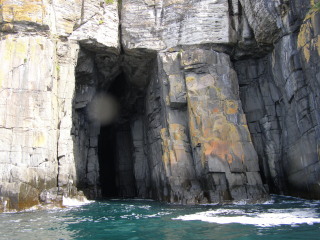 It was soon time to turn back towards Hobart, passing below a World War II bunker, built as part of a line of defence against enemy submarines. 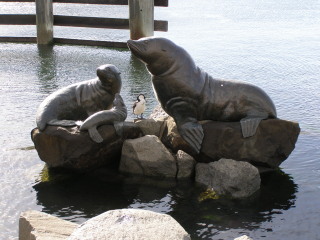 Yes, they did get down here, as well as Sydney Harbour! Back at the wharf, we shed our dripping wet coats and walked back to The Woolstore, ready to relax and warm up before dinner, another free evening. All good things must come to an end, and unfortunately this week was no exception. The mood over breakfast was somewhat subdued as thoughts of homeward flights crept in. It was time to return to reality. Back in the theatrette, we were entertained by Laura’s remaining “Reading Nevil Shute” candidates, each reading their chosen passage, then relating its significance from their personal perspective. 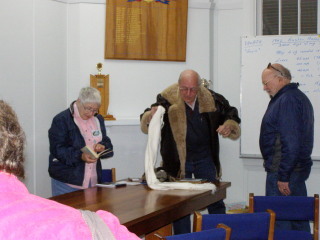 John Anderson chose “Round the Bend”, Alison Jenner “Most Secret”, Beall Fowler “The Chequer Board”, Frank Shepperd “Most Secret”, Gene Crenshaw “The Chequer Board”, Shoshana Milgram Knapp “Incident at Eucla”, Laura Schneider “Pastoral” and William Laing “The Rainbow and the Rose”, a fitting finale. What a thought-provoking and at times emotional session. Morning tea beckoned, in the foyer, before we reconvened to watch both versions of “Lonely Road”. Introduced by John, it has been the most popular choice of films at past gatherings. 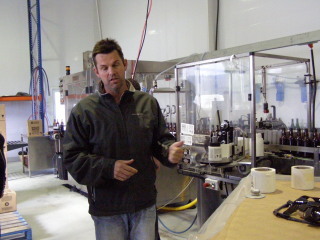 A discussion period followed, comparing the two, pointing out the specific attributes of each production. We had decided to limit the showing of films, to avoid the scheduling conflicts mentioned in previous feedback forms, enabling everyone to participate in all activities. What was the highlight of the week for us? Besides the grand gift we received, it had to be introducing Heather, Mary and Janet, daughters of famous fathers who were good friends. 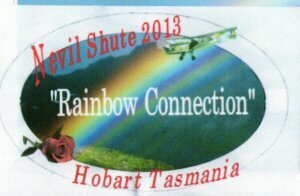 That was a truly meaningful thrill, made possible by our Tasmanian Shute connections and by Heather’s decision to come to “The Rainbow Connection”. Instead of declaring the conference closed once we’d thanked everyone; delegates, presenters, volunteers, special guests and all who’d helped make the week so memorable, we echoed Dan’s words in 2001, that we were merely adjourning for two years. We handed over to Alison, who had agreed to take on U.K.2015, possibly with John’s help. Hoping we’d added to the ranks of Tasmaniacs, and hoping, in the memorable words of Richard Michalak, they felt they’d ‘come home to somewhere they’d never been before’, we wished all a safe trip home! The week’s activities ended with another delectable lunch, complete with the chef’s memorable seafood chowder, before fond farewells, many vowing to renew the bond in 2015. Despite the hard work, nail-biting challenges and unexpected set-backs, it was a great week, thanks mainly to the unfailing and invaluable support, encouragement and advice from our two mentors, Laura and John, without whom we could never have pulled it off. We extend a big thank you to all who undertook the journey down under Down Under, an arduous one at best. A gathering of this type is only as good as its delegates and its presenters. Although the smallest group to date, we are convinced we had the cream of the crop! A special thank you to Heather for making the effort, being the star of the show (literally) and adding something only she could, to make the week perfect. So we hand over to you, Alison (and John?) for U.K. 2015. Best of luck and hope we can join you in Oxford. One final thought (coincidence? 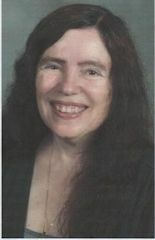 ): Of all our delegates there was just one from Canada, Jean Davidson. Of all my many first cousins, there is just one in Canada, Conde Landale. After chatting with Jean, it came out in the conversation that they both live in Whonnock, B.C. They actually live just over a mile from each other! They have since met and found yet another connection between their two families, going back many years. Fascinating! Overall assessment: Ranged from ‘valuable, enjoyable, very positive’ through ‘very well organised, good balance of activities, commendable attention to detail, warmest congratulations’ to ‘outstanding, excellent, one of the best, wouldn’t have missed it for the world’. Venue: Merino Room: Ranged from ‘aircon a bit cool’ and ‘a little cramped for pre-dinner socializing (otherwise excellent)’ to ’fine, good, very nice, very good, very efficient and excellent, good size’. Theatrette: From: ‘aircon a bit cool’ and ‘missed the camaraderie of cabaret style where we can sit and chat during the day’ to ‘fine, good, except for group discussions‘ to ‘very comfortable, very efficient, excellent, good size to excellent’. Accommodation: Ranged from ‘when booking Sept. 1, website didn’t appear to have any rooms for the 6 days; forced to book elsewhere; later found there were rooms; disappointed their website had no mention of rooms available for Shutists; seems it needed a phone call’ and ‘for personal use, WIFI was problematic; staff helpful but extra fee & erratic usability was frustrating’ and ‘yes, except for drab & dingy decor; light switch behind door next to power points; no hanging space for towels/hand washing’ to ‘yes, very good, meals of high standard, very happy’ and ‘choice of The Old Woolstore could not have been bettered’. Bus excursion: Ranged from ‘yes, very good, immensely and excellent’ to ‘friendly driver; fascinating mix of interest at stops’. Banquet: ‘Lovely food but maybe too much, great for meeting people, delicious, excellent, fun, really great food, great speaker, excellent food & speaker, good food, service, company, interesting & entertaining speaker’. Boat excursion: Ranged from ‘a little cold (no fault of organizers) but efforts by boat company & supplying hot drinks in difficult circumstances were commendable’ to ‘yes, very much, immensely, wouldn’t have missed it’ and ‘beyond expectation, thank goodness for better weather, everyone enjoyed it immensely’. Conference good value? : most replied ‘yes’ with a few exclamation marks, plus ‘very good’ and ‘excellent’. Other comments? : There was one constructive comment regarding name badges; that despite a lot of work, their design made names (and stars) hard to see, so suggest a simple design, less colour and put them on a lanyard, as clips/pins not easy to use, even failing at times. Otherwise, ‘Very good conference, excellent venue choice, good balance between excursion and presentation days, excellently organised, excellent organisation & attention to detail, varied programme, friendly participants, food delicious and excursions 1st rate, company better than everything’. The venue was very welcoming. I liked the “rake” (the slope) of the Theatrette, and the cosiness of the Merino Room. The sound and lighting were good in both meeting rooms, and it was very convenient to have everything close by. The bus excursion was one adventure after another. We do know how to have fun, don’t we? The plane, the yacht, the view, the boats, the orchard and the factory—all of this combined to give continuity with the past and an appreciation of the present. 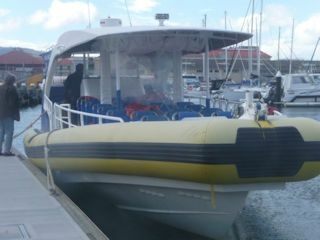 The boat excursion was one big adventure. I would never have imagined it would bring us so very close to nature, or that I would feel a sense of accomplishment in taking this trip. Beautiful views, and a memorable morning. For me, the plane fare was the major expense; the hotel was moderate by American standards, and the conference registration fee was the smallest item. I was happy to have so many of the meals taken care of, and I enjoyed the exhibits, the welcoming packet, the pen (!). I loved all the moments. It’s hard to pick. But maybe, maybe, I loved hearing John Anderson’s riff on Shutitis. Other comments? Thanks, thanks, thanks for all of your work on everything large and small. It all counted. And thanks to the Smiths for the applies. We received many return thanks; people impressed by and glowing with praise for our group, expressing their pleasure at being given the opportunity to be part of such an exceptional event. All were thrilled and On reflection, it appears the alternating of presentation days with excursion days works well, as mentioned in former organisers’ summaries. We could have had more clement weather, but that is in the lap of the gods; it could have been much worse, and at least we did see a rainbow or two, for which it is essential to have some rain! I’m sorry to hear from John that the sound recordings were not entirely successful. The final budget figures will be on the website soon; the last of the cheques went through a few days ago, enabling us to close out the conference account. Regarding name tags, mea culpa! Thank you, those who suggested improvements. My creative instincts overrode the pragmatic ones. Not everything went exactly as planned, but most worked out alright and, as Laura and John predicted, we really did enjoy the week! Lastly, thank you very much to all who sent us their photos! Ours were limited to excursion days and the cocktail reception, so there are many things we don’t have photos of. Next time, an official event photographer!